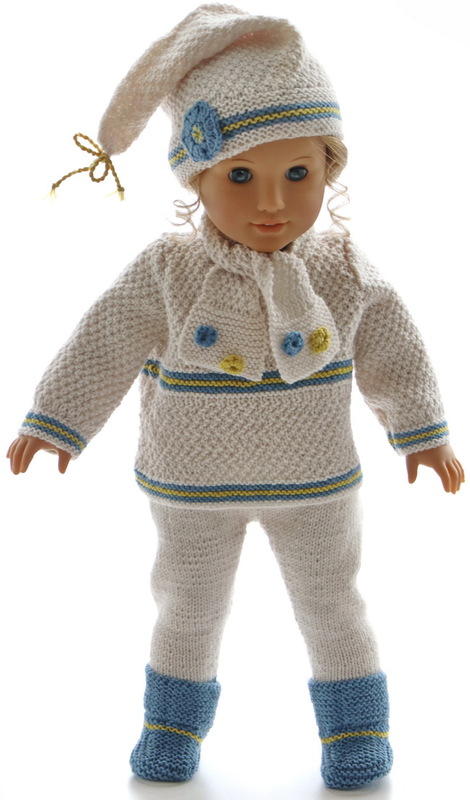 This time I have designed a lovely outfit in white for your doll. The main color is white. 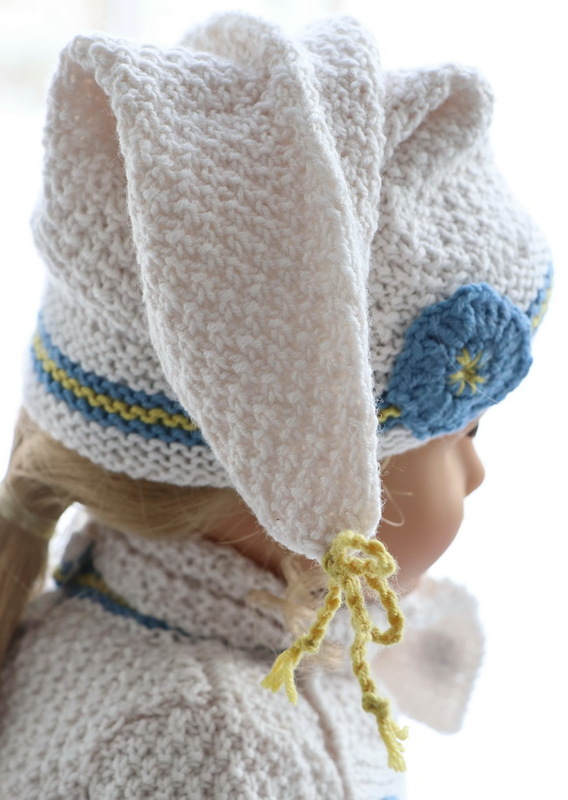 For the edges, I have knitted small stripes in blue and yellow. 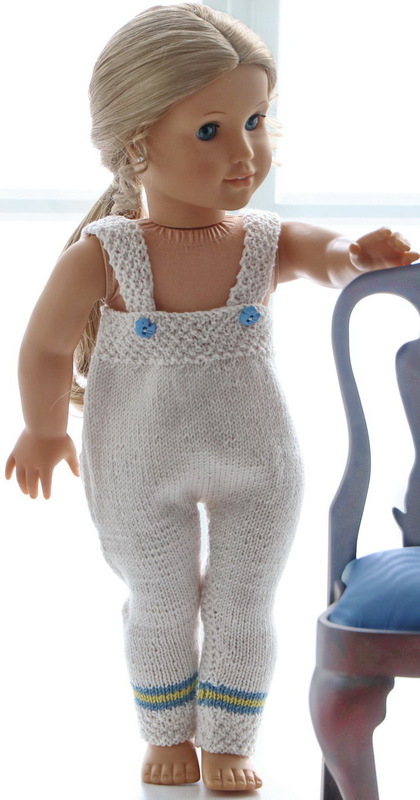 Very plain knitting for this outfit. 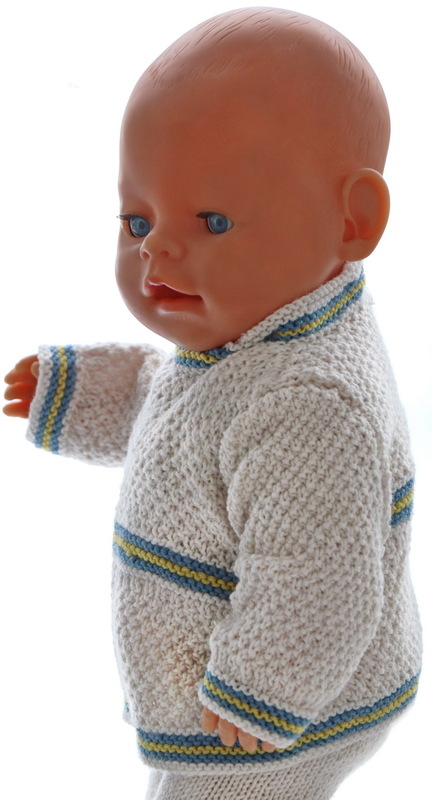 I started knitting the sweater and as told you many times before I love moss sts for doll clothes either it is over 2 or 4 threads. 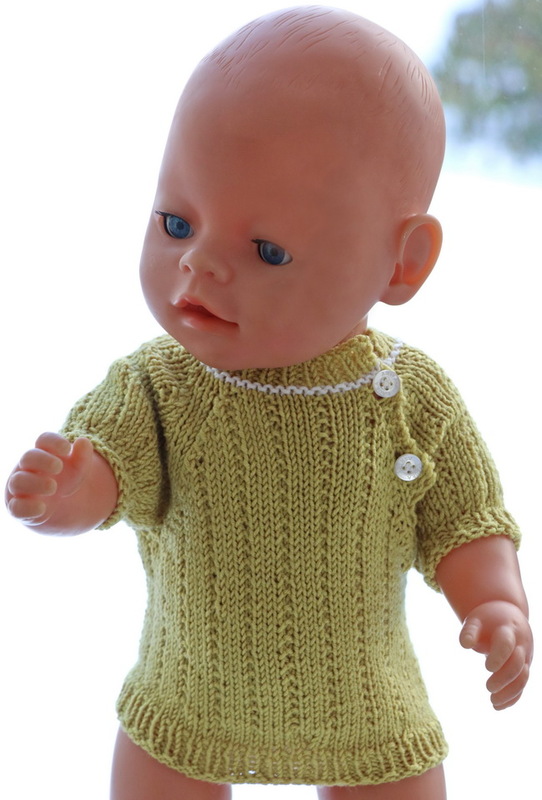 This sweater is knitted in moss sts knitted over 4 rows. 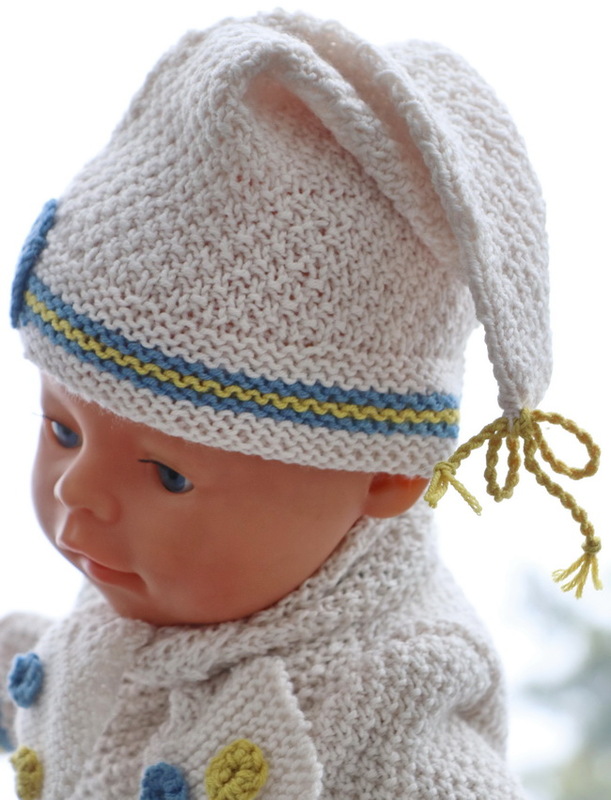 I started knitting the edge with small stripes in blue and yellow knitted in garter stitch. . 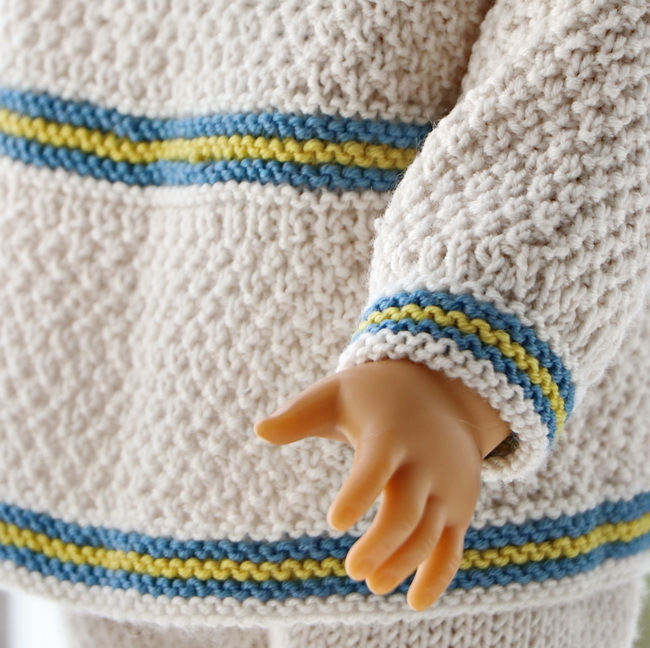 I have used these stripes as edges for this sweater. 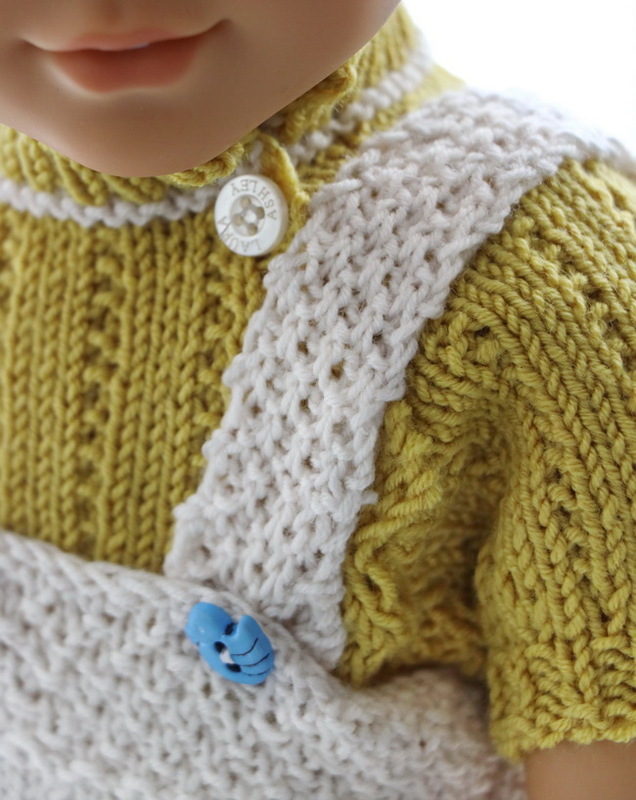 The sweater is buttoned back; it will look great on your doll. Together with this sweater, I knitted a hat in moss sts. ... made a bow of it and sewed it on the end of the cap back. 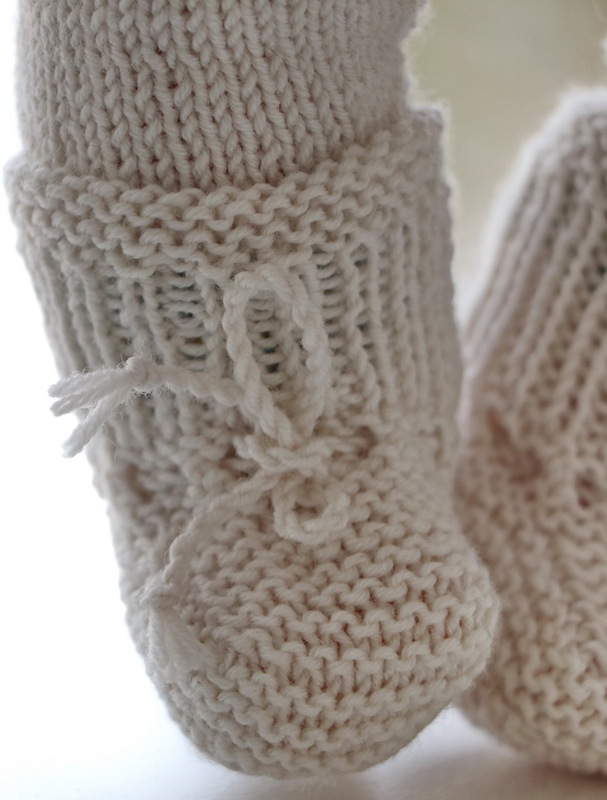 The pants are knitted in stocking sts. 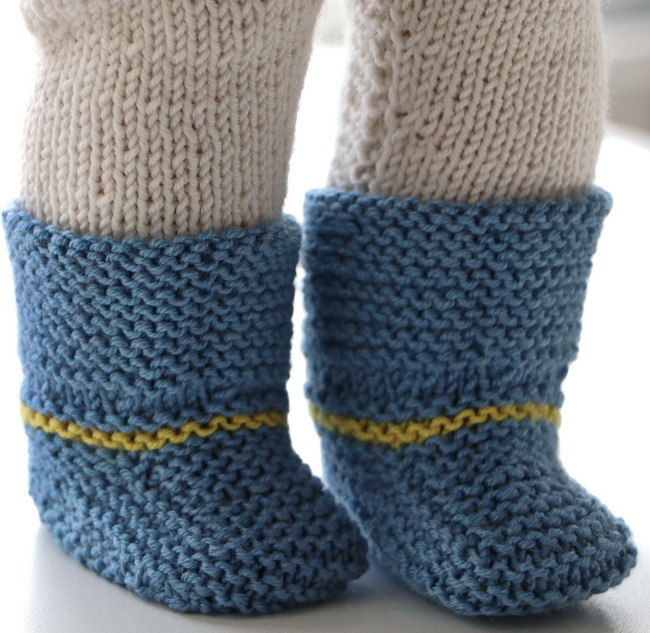 They are knitted like stretch pants and have small stripes of blue and yellow knitted around the ankles. 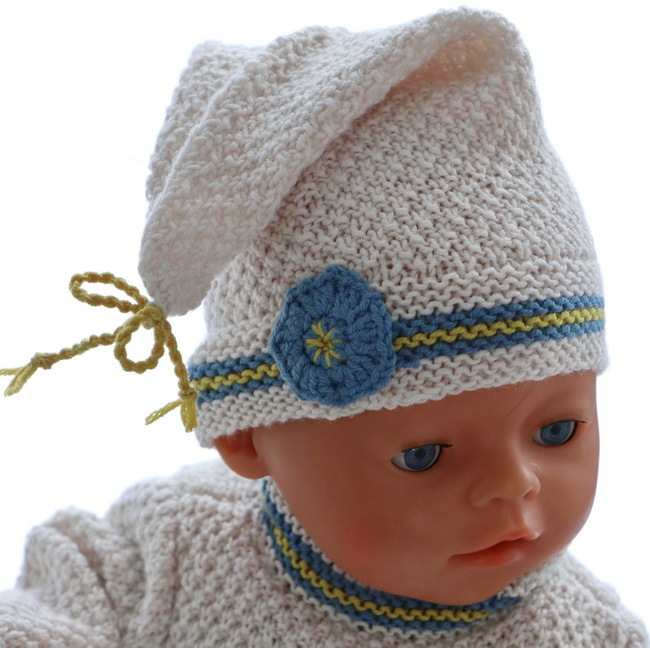 It is knitted in moss sts around the waist and buttoned front with suspenders knitted in moss stitch. To wear inside these pants I knitted a short-sleeved sweater in yellow. 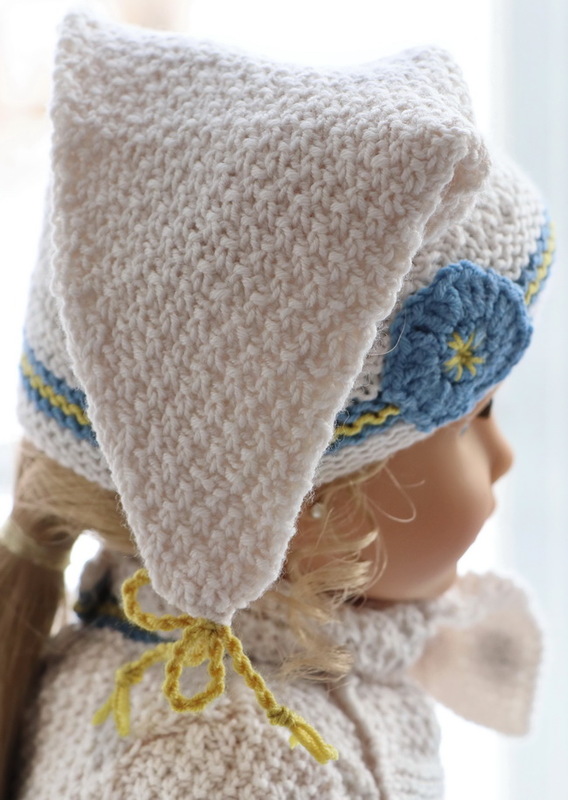 Very plain knitted. There is a little pattern in the same color.
. 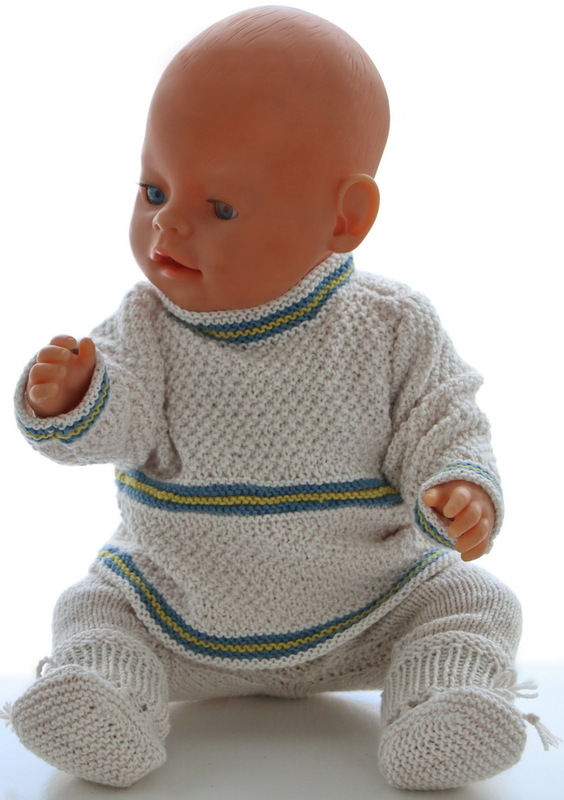 The sweater is buttoned along the raglan front and was superb to wear together with the pants. ... sI and sewed small crocheted flowers on the ends. 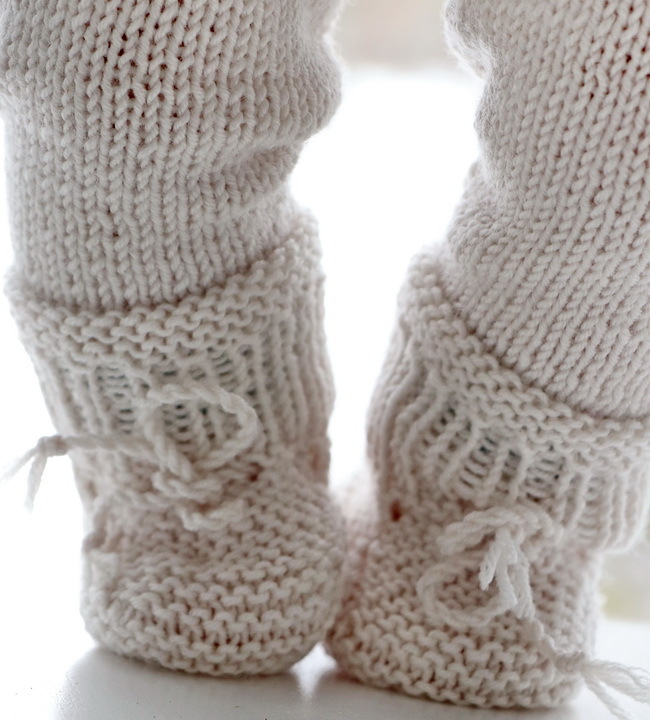 I thought that small white socks would look better for Baby born so here you will find both shoes and socks for your doll.